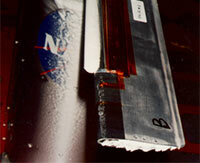 EPIPS is an acceleration based de-icer for ice protection on ships and aircraft. This system provides an efficient low power solution for both metal and composite applications where sufficient electrical power is not available. 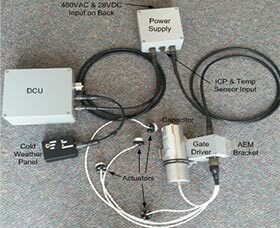 The de- icer features a series of eddy current actuator coils and electronics packaged into an integrated actuator assembly. Actuator coils are strategically placed behind the leading edge to apply impulsive loads directly to the outer surface material. The rapid acceleration de-bonds and sheds ice into the airstream in a very efficient manner. The Shape Memory Alloy (SMA) Deicer uses cutting edge technology to autonomously detect and remove ice from helicopter blades. The deicer is made from a durable Nickel Titanium alloy that has the ability to change shape when activated. This deicer provides an efficient solution for rotorcraft applications providing superior erosion resistance. 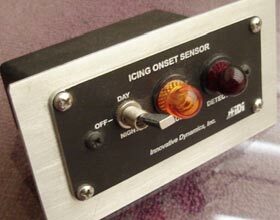 The Icing Onset Sensor is a flush mount sensor for aviation applications that detects initial onset of icing and indicates when critical ice levels are reached. It uses capacitance based technology to continuously monitor for icing. 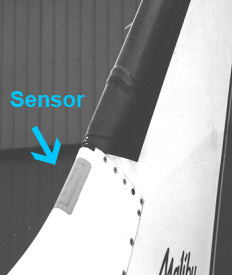 The sensor consists of a copper electrode pattern embedded in a polyimide laminate which is attached to the airfoil surface. Sensor dimensions are tailored to custom applications in accordance with the leading edge curvature, angles of attack, and icing prone region. 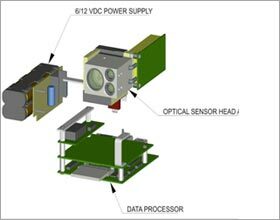 AIMS is a compact optical based sensor that measures particle size, density and phase of clouds. Low power infrared lasers illuminate the interior of the cloud and the resulting backscattered signal is analyzed in real-time. The cloud property data is saved to an on-board data logger and can be transmitted to a ground station via RF link. The compact and rugged design makes it ideal for small aircraft, UAVs or weather balloons. In addition to enhanced weather forecasting, this sensor has potential to provide in-flight icing hazard and volcanic ash warning.